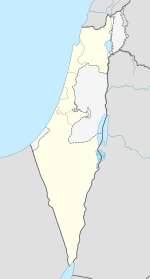 Ramla (Ebreu: רַמְלָה‬ Ramlāh; Arabic: الرملة‎ ar-Ramlah, an aa Ramlah, Ramle, Remle an whiles Rama), is a ceety in central Israel. The ceety is predominantly Jewish wi a significant Arab minority. Ramla wis foondit circa 705–715 AD bi the Umayyad Caliph Suleiman ibn Abed al-Malik efter the Arab conquest o the region. Ramla lays alang the route o the Via Maris, connectin auld Cairo (Fustat) wi Damascus, at the intersection o the roads connectin the port o Jaffa wi Jerusalem. It wis conquered mony times in the course o its history, bi the Abbasids, the Ikhshidids, the Fatamids, the Seljuqs, the Crusaders, the Mameluks, the Turks, the Breetish, an the Israelis. Efter an ootbreak o the Black Daith in 1347, which greatly reduced the population, an order o Franciscan monks establisht a presence in the ceety. Unner Arab an Ottoman rule the ceety acome an important tred center. Napoleon's French Airmy occupied it in 1799 on its wey tae Acre. Most o the toun's Arab residents wur expelled durin the 1948 Arab-Israeli War while ithers remained in the toun. The toun wis subsequently repopulatit bi Jewish immigrants. The Giv'on immigration detention centre is locatit in Ramla. In recent years, attempts hae been made tae develop an bonnify the ceety, which haes been plagued bi neglect, financial problems an a negative public image. New shoppin malls an public pairks hae been biggit, an a municipal museum opened in 2001. ↑ "עיריית רמלה - אתר האינטרנט". Ramla.muni.il. Retrieved 2009-05-06. Wikimedia Commons haes media relatit tae Ramla.